In this episode we talk about engineering pranks through the years. Tar is a black, thermoplastic material produced by the destructive distillation of coal, and was widely used in the early and mid 20th century for binding together aggregates, such as gravel, in road construction. While tar comes from coal, asphalt is derived from crude oil, and has a higher softening point than tar. A highly viscous liquid that is similar in appearance to tar, asphalt is widely used to bind aggregate particles together into asphalt concrete. This episode marks the two-year anniversary of The Tar Road The Engineering Commons podcast! Many pranks have been carried out through the years at MIT and Caltech. One of the earliest pranks at MIT (in the 1870’s) involved sprinkling iodide of nitrogen, a mild contact explosive, across a military drill field, thus causing small fireworks to erupt as students carried out their marching exercises. 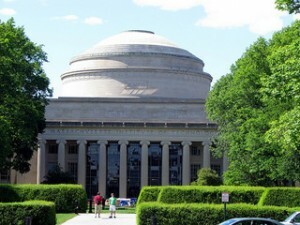 The Great Dome, situated atop Building 10 at MIT and approximately 100 feet in diameter, has been the sight of many pranks. In 1999, the Great Dome at MIT was transformed into a giant version of the Star Wars character, R2-D2. A police cruiser mysteriously appeared atop the Great Dome in 1994. In 2012, the Green Building at MIT was turned into a giant Tetris game. 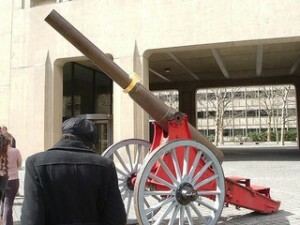 MIT students stole the Fleming Cannon from Caltech in 2006, shipping the 3 ton device all the way across the United States to be displayed on their Boston campus. Cost of the hack: around $7,000. A hollowed out pumpkin was placed atop a tall spire on the Cornell campus in 1997. The pranksters who pulled off this feat have never been identified. During the University of Chicago’s scavenger hunt in 1999 students earned points for building a nuclear reactor in a shed. Albert Einstein apparently invented a wood-powered refrigerator. Caltech students pulled off the Great Rose Bowl Hoax during the 1961 Rose Bowl football game, causing the University of Washington’s card section to display messages that were altered from their intended configuration. In the final display, captured by network television, the card section spelled out “Caltech,” leaving little doubt as to who had pulled off the prank. There is some debate as to whether or not the Super Bowl was pranked in 2007 by Zug.com, which closed down in 2013. Brian references the movie Real Genius, in which a car was disassembled in the parking lot and reassembled inside a dorm room. MIT students inflated a balloon in the middle of the football field during a game between Harvard and Yale in 1982. Engineering students from the University of British Columbia have been hanging Volkswagen Beetles from every imaginable structure over the past thirty years. This includes a library (1996), a bridge (1999), a train bridge (2000), the Golden Gate Bridge (2001), the Lions Gate Bridge (2008), and a clock tower (2014). Apparently the rate of pranking slowed down at UBC after five students were arrested in 2009. An extended article in Popular Science describes the process of planning and executing the stunt of hanging a car off the Lions Gate Bridge in 2008. Fictitious student George P. Burdell has been earning degrees at Georgia Tech since 1927, without ever attending a single class. In 1972, Signetics released a datasheet for a “write-only memory,” which is a rather useless device! Brian mentions the infamous Retro-Encabulator video, which is always worth a link in the show notes. On April 1, 2013, Power Knot, LLC released a video describing a “disertator” that was self-powered, and could turn waste metal into gold. Carmen notes that integrated circuit (IC) designers like to add personal notations to their IC chips. With the approval of his boss, Carmen pranked one of the designers in his office. Anybody have coordinates for the goldfish-shaped retention pond that Adam mentions? Carmen notes that a Dutch artist has created a dead pixel in his yard, so as to confuse Google Earth users. Adam has seen the xkcd cartoon about Highway Engineer Pranks. Jeff gripes about a Michigan Left intersection recently built in his area, which differs somewhat from the Jughandle intersection that Carmen has encountered. A LEGO manager had his real car replaced by a replica built completely of LEGO blocks. Carmen describes a prank involving the addition and removal of gasoline to mess with an engineer’s fuel mileage calculations. A mysterious appearance on Chicago television of someone wearing a Max Headroom mask in 1987 is still a matter of conversation, as the instigator has never been identified. In 2007, Boston officials thought they were dealing with improvised explosive devices when they discovered battery powered circuit boards with LEDs displaying a pattern that resembled characters from the Adult Swim animated television series. Some Australian pranksters decided to reconnect a friend’s plumbing so that every faucet became a beer tap. Thanks to Keri Garel for the photo of Caltech’s Fleming cannon, titled “04-06-06MIT2.” Thanks also to Wit Suphamungmee for the photograph of MIT’s Great Dome. Podcast theme music (for both The Engineering Commons and The Amp Hour) generously provided by Paul Stevenson. Our thanks to Chris Gammell and Dave Jones of The Amp Hour for permission to use their theme music in this April Fool’s Day edition of The Engineering Commons.. I just wanted to say that I have actually used that xkcd bridge interchange comic in a school presentation before. In the slide shows I create, I like to have a joke slide at the end to add some humor and I put it at the end of a presentation for prestressed concrete design because it was basically a bridge design project. It was one of the better joke slides I’ve used too.